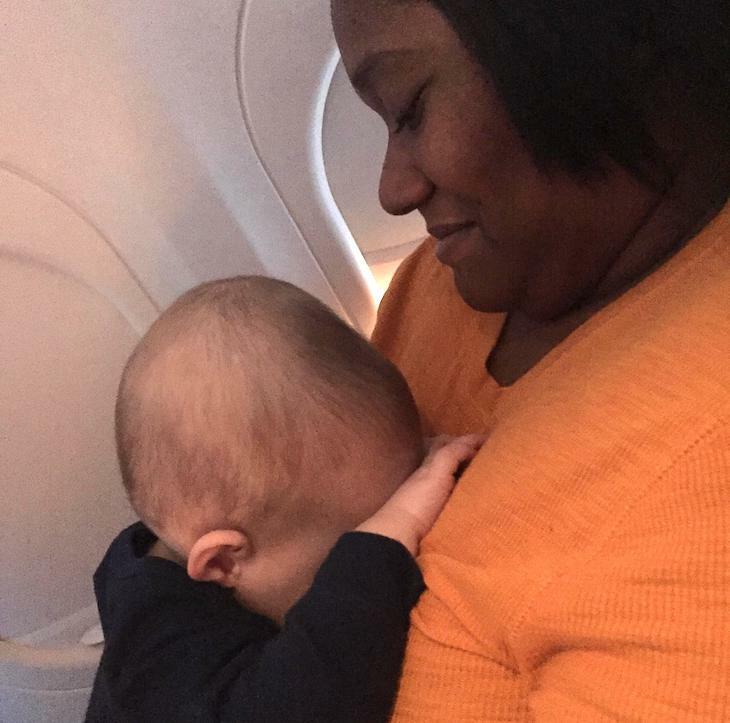 Babies are notorious for making plane rides miserable. Although we can’t blame them for the discomfort and hassle of airline travel, their whining and fidgeting is enough to make any seatmate a bit frustrated! But instead of getting irritated with the antsy baby next to her, one woman did something completely out of the norm! One Imgur user was on the plane with his son when things started to go south. The little one was fussy, disoriented and kept trying to crawl onto the woman’s lap sitting beside them. After numerous failed attempts to wrangle in his son’s flailing arms and legs, Dad was on the brink of losing it himself. “I was having an awful travel experience on Sunday after my [significant other] and I got separated in Chicago due to weather. This was only Little Man’s second flight ever (he’s 8 months old) and he was doing so well until he wanted to go see my neighbor in the window seat. “Not 60 seconds later he puts his head down on her chest and falls asleep! ‘Power of the boobies,’ she jokes. She then proceeds to tell me that if I wanted to take a quick nap that she would be more than happy to hold him while he slept. After multiple cancellations and layovers I selfishly agreed to give her watch over my precious child so that I could catch a quick catnap. The kindness of this stranger was truly refreshing on what was quickly becoming one of the worst days in a long time. Sure enough, the ansty little boy was sound asleep – nothing in the world could wake him at that exact moment! This father was lucky to have such a kind, generous and loving woman sitting besides him. We can all learn a little bit from her actions. Even though he didn’t know her, this sleepy Papa was grateful for the kind stranger sitting next to him. Both of the boys got some much-needed rest on that plane ride!